We use the social group work method. promotes growth in individual kids and the group as a whole. We are able to help the kids “bounce back” and succeed in spite of the challenges they face. We especially help by providing caring relationships with workers, and creating meaningful relationships among peers. 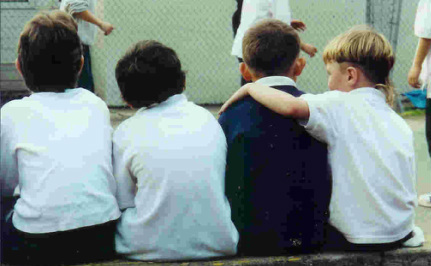 All children need to experience a sense of belonging as they grow up. Group experiences like band, scouts, sports, student leadership help children learn how to work as a group, how to make decisions, how to solve problems, and how to get along….skills we use as adults every day. Our kids lack access to these types of experiences, due to lack of availability, lack of resources to join, or lack of ability to successfully participate because of behavior. We are about the “whole child,” not just how the kids behave while they are here. By visiting them at home and at school, we can increase our understanding of their context and fine-tune our approach with them. The children who come to our programs know that we always like them, even if we do not like their behavior. They learn that they can change their behavior, and are better able to make these changes with the support of a worker who has faith in them. In our very zero-tolerance world, there has to be a place where kids can be accepted as they are and invited to keep on growing. Stanford Settlement is that place for kids in our community.